Rhubarb leaves are poisonous, chock full of more oxalic acid than humans and animals may safely consume. Small amounts of oxalic acid are found in the stalks, which we eat – the acidity gives rhubarb its “tang.” (You’ll find small amounts of oxalic acid present in sorrel and spinach, as well). Contrary to popular belief, even though rhubarb leaves are poisonous, they actually can be composted. 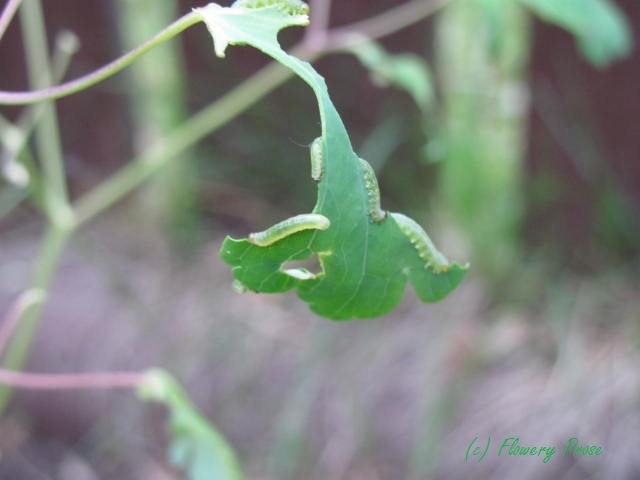 The acids in them will break down like any other natural chemical found in plants and will not cause the compost to become toxic. Just make sure you chop those gigantic leaves up so that they’re easier for your composter to break down quickly. And you might not want to put too many in the composter at once, as not to upset the balance of the carbon to nitrogen ratio. The part of rhubarb that we eat is the petiole of the leaf. Rhubarb is a perennial. And it is supremely tough and cold-hardy, so you usually have to do something really, really horrific to kill it once it becomes established. Like drive over it with a truck. Or set it on fire. And it may even survive those things. Rhubarb is botanically a vegetable, but we treat it like a fruit in cooking and often eat it in desserts. In 1947, the United States gave it the legal designation as a “fruit” to avoid the high tariffs imposed on imported vegetables. (It was cheaper at the time to bring fruits into the country). You’ll sometimes hear rhubarb referred to as the “pie plant.” If you’ve ever eaten rhubarb pie (or even better, strawberry rhubarb pie), it’s not difficult to be a supporter of this nickname. If your rhubarb stalks are green, they’re not underripe or something. Some cultivars have greener stalks than others. The red colour is due to the presence of anthocyanins, the same chemicals that make the leaves of some deciduous trees turn red in the autumn. Rhubarb reached Europe via the Silk Road in the 14th century. The plants were brought to North America by European settlers in the early 1800’s. If you like to dye textiles with natural plant-based dyes, rhubarb leaves make a good mordant (just be really careful while handling them!). The roots will produce a brown dye. In the United Kingdom, it is common to force an early rhubarb crop under pots in January and February. A second crop is planted outdoors for later harvest. Store harvested rhubarb stalks in the fridge and use them up as soon as you can. Rhubarb freezes well so that’s an option if you have a huge harvest. Do not harvest rhubarb in the heat, as the stalks will quickly wilt. 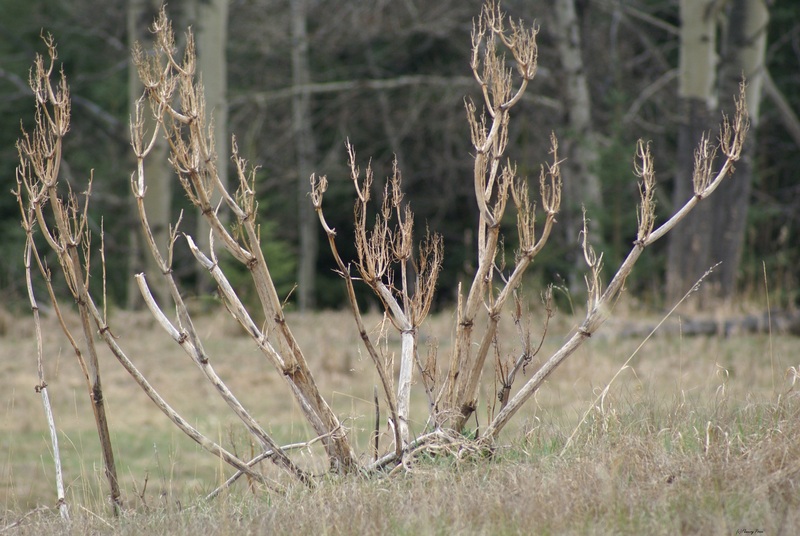 Speaking of harvesting rhubarb – pull or cut? Always pull! If you cut the stalks, you might encourage rot. And never, ever, take more than half of the stalks of the plant at a time. If your rhubarb is damaged by a late spring frost, you can remove most of the stalks (leave at least 3 to 5 on the plant) and allow the plant to regrow – it should produce another crop shortly. Don’t eat the frozen stalks. Rhubarb has really pretty, dramatic flowers – and as long as you don’t allow them to set seed, you can enjoy the flowers for a very brief time. You can keep harvesting the rhubarb stalks while the plant flowers – the quality of the produce does not suffer. If the plants set seed, however, the energy that would be devoted to the creation of delicious stalks is then diverted to the seeds, which you don’t want. You’ll end up with smaller stalks as a result. 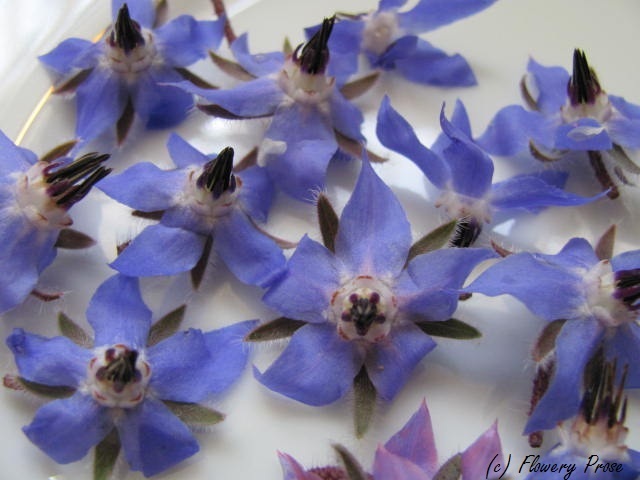 So if you want flowers AND yummy stalks, watch carefully to remove the blooms at just the right time. The word “rhubarb” may also refer to a loud dispute; in the 1940’s, it was commonly used as a descriptor of the on- and off-field shenanigans of fans and players at raucous baseball games. In 1930’s theatre, the repetition of the word “rhubarb” by stage actors was used to simulate background conversation. (UPDATED MAY 2018) – I found a fantastic audio file of the sounds forced rhubarb makes as it grows – how fun! Check it out here. What are your favourite rhubarb recipes? (Please go ahead and post links – I’m always on the hunt for more!). 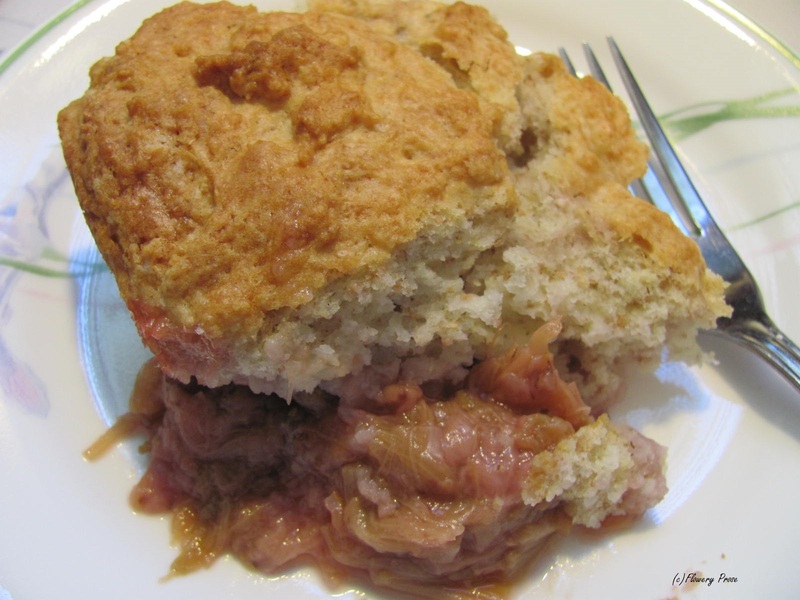 Here are a couple of my favourites, from my (former) blog at GRIT.com: Rhubarb Coconut Muffins and Rhubarb Oatmeal Cake. Rhubarb and a garden update. The very act of writing it down might jinx it, but…it looks like we’ll be snow-free this week! No white stuff in the forecast, for once! I’m massively excited about that – it means maybe, just maybe, I can get a bit more work done in the garden. In between snarly springtime bouts of rain and snow and sunshine last week, I finally cut back all the perennials, and dug in some of the leaf litter. I removed a fair amount of leaves as well – there are several green ash trees and poplars nearby so you can imagine the quantity I’m dealing with. I sidedressed the existing plants with new soil and compost (including some of the castings my vermicomposting worms had busily created over the winter). Hopefully I’ll have enough time after work this week to get the edging started – not my favourite job (is it anyone’s? ), but it always looks so nice afterwards. Over in the community garden, I’m delighted to report that the building of the hoop tunnel that I had blathered on about last year actually took place a couple of days ago. Better late than never or something like that. (I’ll post a photo later this week). The community gardening group held its spring clean up event on Saturday – it was so muddy we risked compacting the soil in the perimeter beds, and so cold very few weeds had popped up to pull (which I’m totally not complaining about). We focussed our attention on other tasks instead, and I’m fairly certain we may now have the cleanest garden shed in the province…. I was so happy to see that the rhubarb in the community garden is starting to emerge. We are currently splitting the produce from one plant between 30 garden members, so we each average a haul of about two stalks per season. I already have plans for mine: Special Rhubarb Cake. It seems like a must-try, don’t you think? Or do you have another favourite rhubarb recipe to recommend? Recipes: Rhubarb-Strawberry-Honey Lemonade and Rhubarb-Strawberry Cobbler. Place the hot fruit into a 9″ square glass baking dish and top with spoonfuls of batter. Bake for 30 minutes. Enjoy warm, with cream or ice cream! 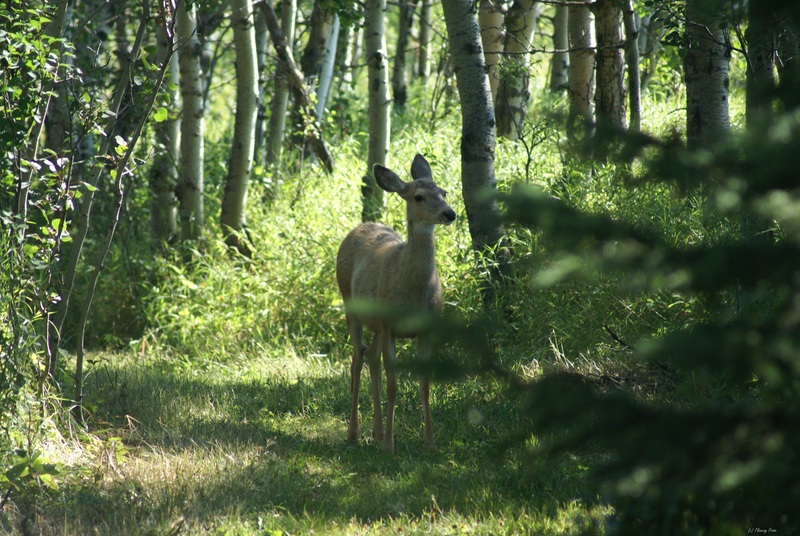 My hubby and I took a quick dash up to Banff National Park this past weekend, and although we didn’t have time to do any serious hiking, we managed to walk some sites we’d never been to before. 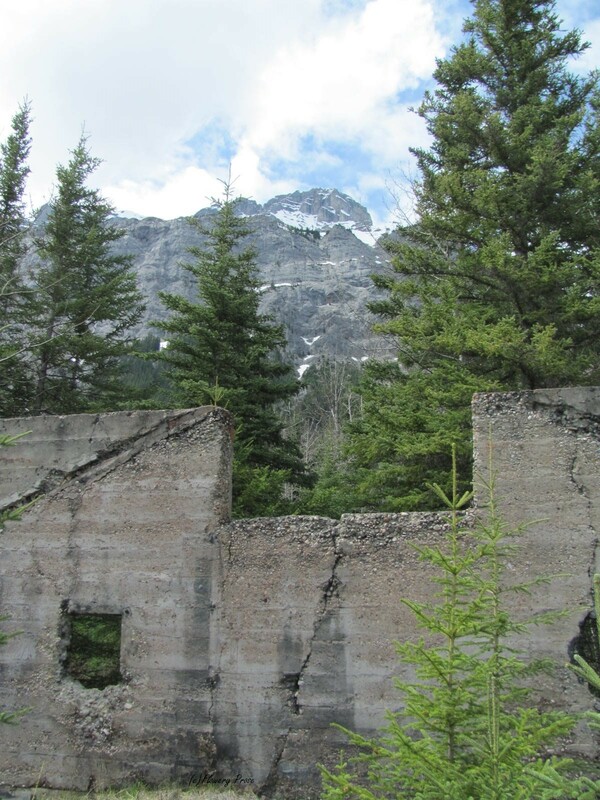 The most eye-opening place was the old townsite of Bankhead, a mining community that sprang up in 1903 to extract coal from nearby Cascade Mountain. Nestled against Lake Minnewanka, Bankhead rapidly boomed – at one point, the town had 900 residents, running water, electricity (and, according to one interpretive sign, tennis courts!). The glory days all ended abruptly in 1922, when the lease of the parks land from the government ran out. 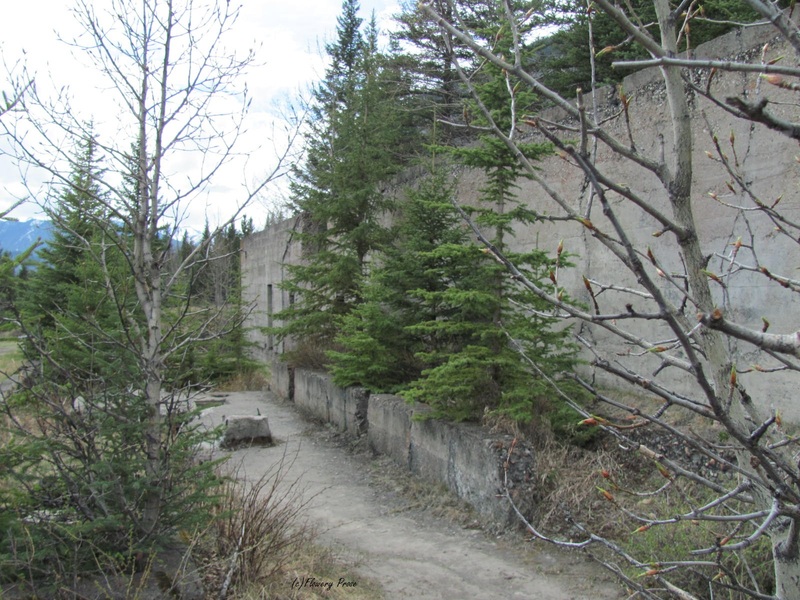 High costs and declining production further sealed the deal, and the town was shuttered. 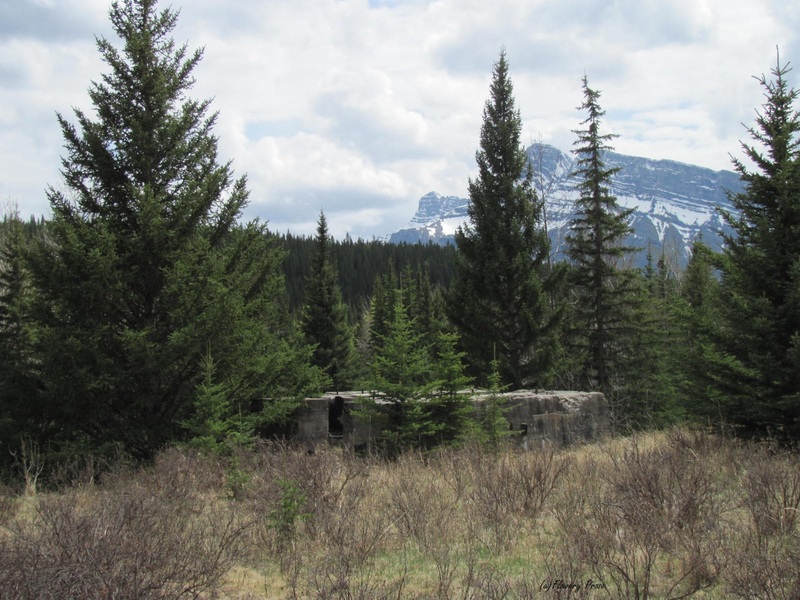 By this time, Parks Canada was no longer interested in the mining business, either – its focus had shifted from exploitation of resources to conserving them. (Indeed, within the decade, mining would be banned in the national park). 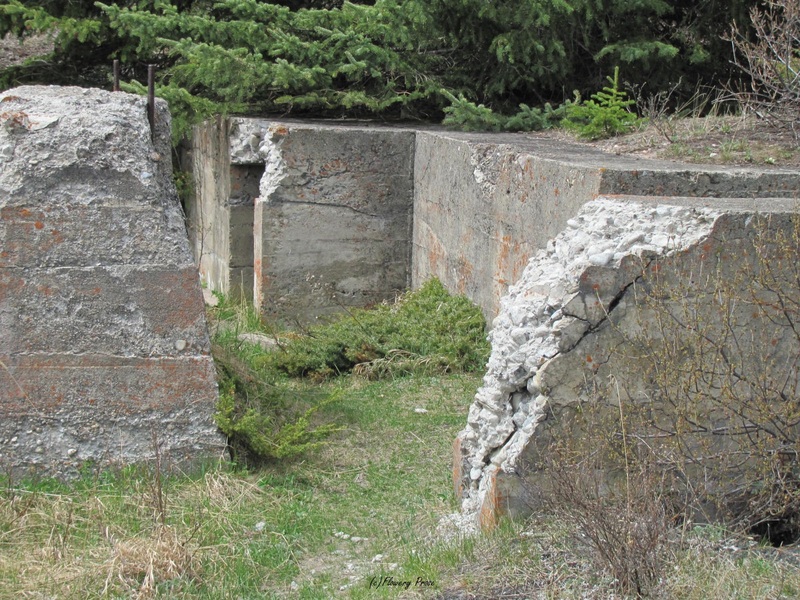 The citizens of Bankhead relocated to neighbouring towns: Banff, Canmore, or Calgary, and all of the buildings in the town were demolished. 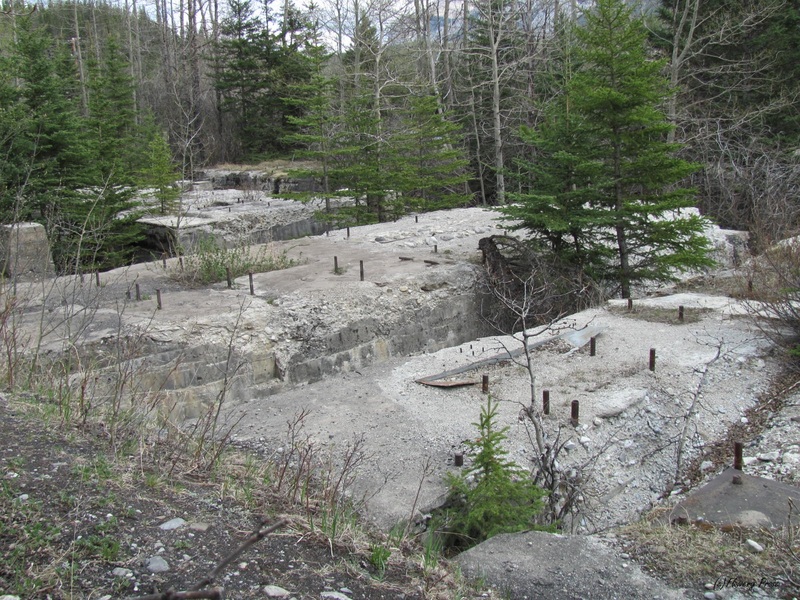 Walking among the industrial ruins of Lower Bankhead gives you a sense of how large the mining operation was, and how many people it took to keep all of the machines running. Apparently, in 1911, when the mine was at peak production, 450 men yanked 500,000 tons of coal from the mountain. Most people don’t think of rhubarb as exotic. Historically, I don’t know how it happened that someone decided to pull up a stem and consider taking a bite, but my hat’s off to them, and to all the incredibly delicious rhubarb desserts that have been made ever since. 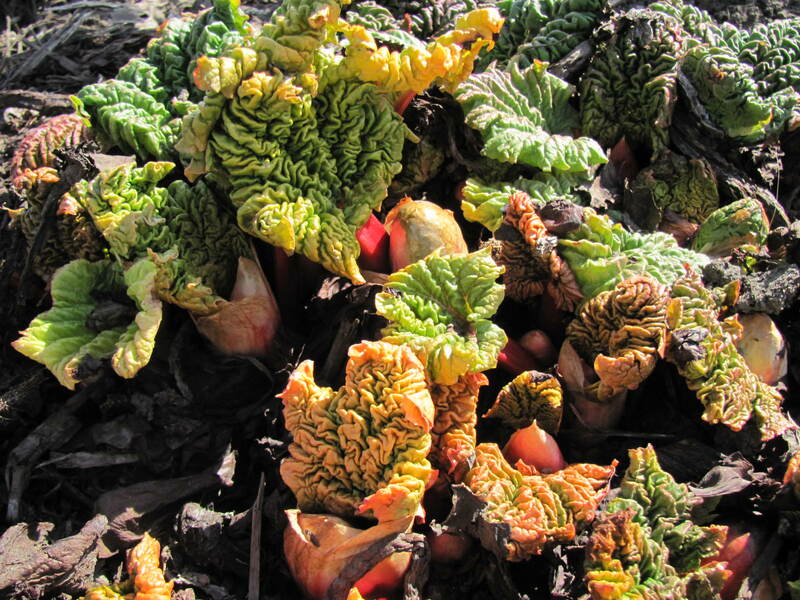 Obviously the Chinese figured out that the stems (botanically called petioles) were valuable for medicine; they had been consuming rhubarb for thousands of years before medieval Europeans decided they had a hankering for the taste of the jewel-red stalks. And consider this: the high shipping costs to bring rhubarb all the way from China to Europe way back in medieval times rendered it as valuable as other botanical commodities of the time, such as cinnamon, saffron threads, and even opium. (And we think our grocery bills are expensive! No word on whether or not medieval sailor-explorers consumed quite a bit of their cargo en route; rhubarb, is, after all, chockful of scurvy-fighting vitamin C). Not bad for a perennial vegetable we tend to think of as a bit on the common side. Once established, you could probably drive a rhubarb plant over with a very large truck and hardly do any damage (I jest, but just barely). It’s hardy, virtually pest-resistant, and depending on your climate, you can get up to two sizeable harvests in a season. Mature rhubarb has few cultural requirements: it should be watered regularly and offered a good source of nutrients. Indeed, that is the key to successfully establishing rhubarb: food. It has a thing for well-rotted manure (not fresh, as that may burn), or compost. Be sure to give it a good spring dose. 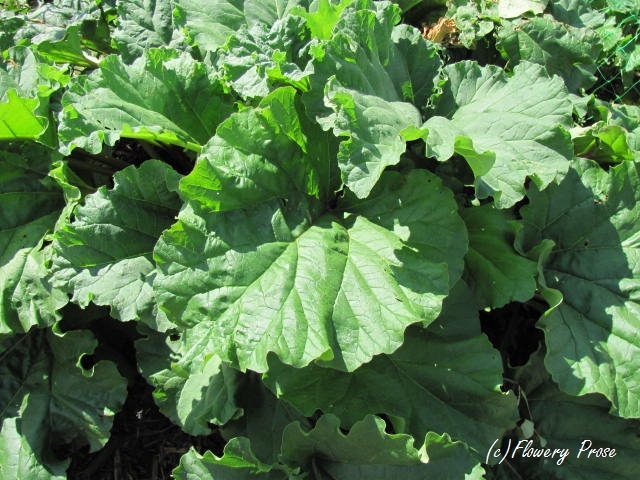 Apply fertilizer around the growing plant, do not heap it on top, and be careful when incorporating it, especially if the rhubarb plant is young. They have sensitive root systems that do not like to be tampered with. Rhubarb must have a specific period of winter dormancy to be successful, making it a great choice in cold climates. It is not particularly resilient in the face of constant freeze/thaw cycles, however). 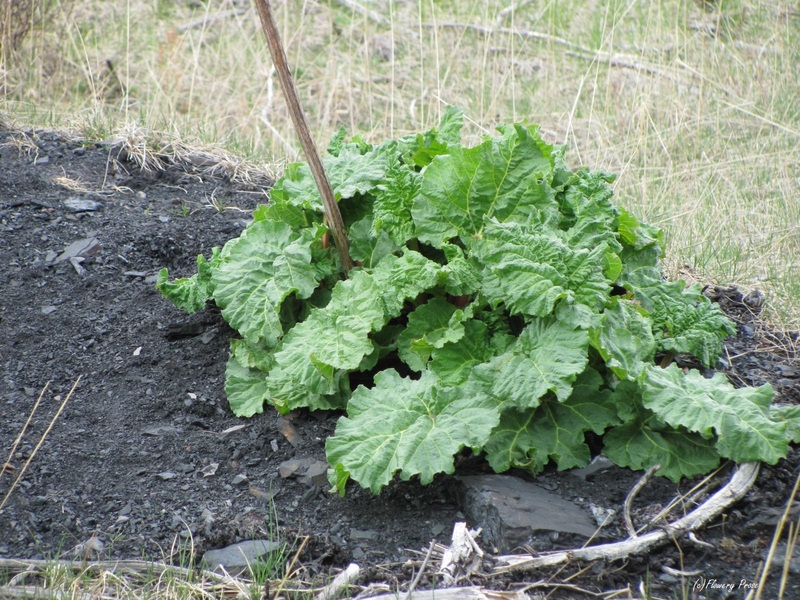 Rhubarb also likes slightly acidic soil, around a 6.0 pH. 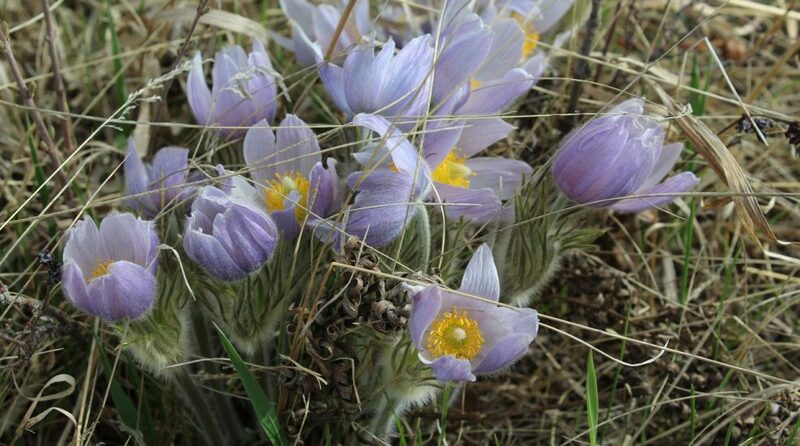 It doesn’t like to sit in boggy soil, so ensure you’re not planting it in a low spot or in heavy clay. Keep rhubarb out of the hot sun – it prefers a partly shady spot where it won’t languish and wilt. Likewise, it won’t perform in total shade – it’s like Goldilocks and needs a “just right” resting place. If you want to give the tender shoots a leg up in the spring, you can cover them with a properly-sized cloche for extra protection, until the weather warms sufficiently and the danger of frost has passed. Don’t harvest newly-planted rhubarb plants until the third year – they need all their energy reserves to sufficiently establish themselves. And if you want more productive plants in subsequent years, do not harvest all of the stalks at once. Rhubarb lives fifteen years or longer, but should be divided every five years to “refresh” the plant. And, there you have it. Those medieval Europeans were definitely onto something – they obviously knew the value of a big slice of rhubarb upside-down cake with a dollop of whipped cream!